There is lot said and preached on parenting now a days (and I have noticed most of the preachers don’t even have any kid !! :-) ). But Swa-Darshana parenting approach is different. Our strong belief is that every individual is different so there can’t be any thumb rule for parenting. We consider a child as a Seed. And as we know different seeds have different environmental needs; for example if we put a seed of mango in the environment which is suitable for paddy, that seed will not grow but the problems is not with seed. It is with environment. Same happens with child also, child is destined to grow if he is not able to grow then there must be some issue with the environment given to him. So child development basically involves two processes, first to understand child and his environment and second to bring desired changes in environment which are best suitable with kid. So in Swa-Darshana parenting program, We first try to understand the intelligence and personality of kid with different methods, we understand child's thought process and negative/positive factors affecting it. We understand each parent as individual, and as a couple and then we come out with customised ‘To Do’ list with lot of brainstorming with parents ( and if needed kid too). Complete Swa-Darshana Parenting program is supported with follow up calls and sessions to reinforce your understanding about parenting and help you provide smooth transition between a common parent to a Swa-Darshak Parent ! So, before it gets too late, take a step to be a systematic parent it is just a call away. DMIA ( also known as DMIT ie Dermatoglyphic Multiple Intelligence Analysis ) This methodology is based on the interrelationship between a human finger prints and his/her personality and intelligence. From ancient times lot of people have done research on this subject lot of modern researchers and scholars have done lengthy research on this subject to establish the co-relation between brain-mind and fingerprints. Our team has carried out in-depth studies with the help of experts of various fields and invented state of art 3D-DMIA, which is enhanced version of traditional DMIT. 3D-DMIA takes care of certain limitations of traditional DMIT and gives more clear way forwards to the client. If you want to know the hidden aspects related to inborn intelligence and personality, this is a very nice option for you. 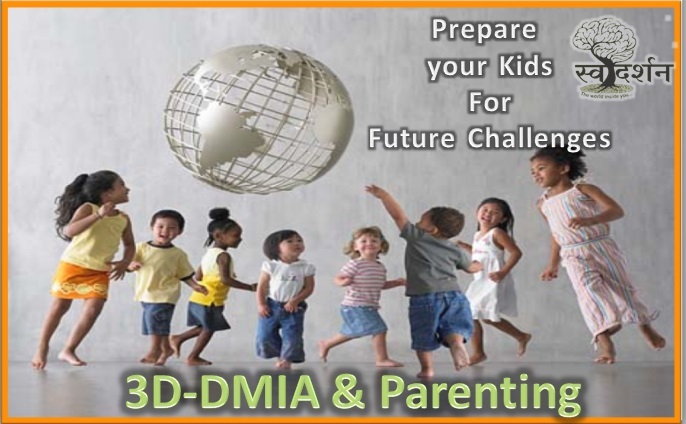 3D-DMIA gives detailed report about your inborn potential traits and ways to how to nurture them for better future. 3D-DMIA is very popular among modern parents in deciding career path for their kids.